Castle will return to ABC on February 1, but the series is surrounded by buzz at this time. Both the ABC powers that be and the men in charge of the current season of the series are wondering what will happen next on the series. Will a ninth season happen? 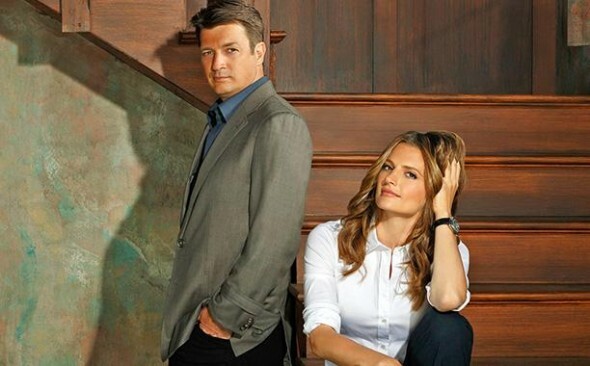 TV Series Finale reported yesterday that Paul Lee, ABC President, is willing to spin-off Castle if the stars of the series, Nathan Fillion and Stana Katic, left the series. Hawley would like the series to continue with the same cast, but he made it clear that the writers need to know what the future of the series so that they can plan the final episodes of this season, Episodes 21 and 22. In addition to the planning for season nine, Hawley revealed that all the currently open storylines on the series right now will be closed out by the end of this season eight. That would allow season nine to go back to the “case of the week” format. Are you a fan of Castle? Is time for the series to end, or do you want to see more? Tell us what you think. How can I learn the specifics of a prop I saw (a painting) in S6-Ep9? The painting appears to be a post-modern abstract, dominant colors in the red-orange range, about 4′ X 4′. It is seen in that episode’s scened in the leased apartment. I will continue to watch season 1-7 on DVD because it was the best show on tv for 7 years. No other show could touch it for drama, laughs and Stana’s (Beckett’s) heart warming smile. Us UK viewers are 2 episodes behind you in the USA which is good because I’m on holiday ( Sorry on vacation) when the last 2 episodes are shown over here. So I will not see how they kill Beckett off. I want to remember Beckett as a smart beautiful detective with a wonderful smile not a corpse. This is still my favorite show of the week. PLEASE don’t cancel Castle!! And don’t get rid of the characters that we have come to know and love. Leave Castle as is and bring it back!! Yes. Yes. You’ve got it. So…Castle Fans Unite !! You have nothing to lose but your delusions that celebrity actors are not Prima Donnas. We’ve been betrayed and manipulated. WE forgot that actors act the roles written by writers. WE MUST not forget that writers write characters and plots that please the low-cunning, feral executives of prime time TV programming. We’re angry but it’s over. Our anger may reflect the anger of millions of Castle Fans who never expressed their feelings in writing as we have. But we’re through. Stana, Jon and Seamus in a new show called Mrs Castle without silly Nathan’s input. Will it be LokSat or the motorcycle that kill Beckett?